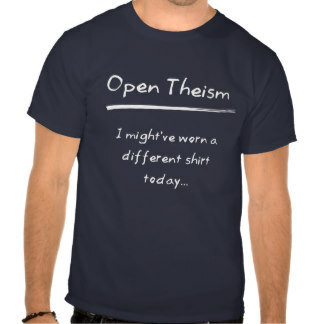 What I’d like to do here is lay out the basic beliefs of Open Theism (sometimes called, “the Open View”) in as much non-technical language as possible, so that it’s more accessible to folks not familiar with some of the complex language that gets used in theological and philosophical studies. Doubtlessly, something might be lost for those who would prefer more technical language, and probably some of the things I say about Open Theism may not appeal to every-single Open Theist, but since accessibility and the hope of understanding for a broader audience is the goal here, I’ll have to sacrifice some variations of the view and some jargon. Ok, let’s go a little deeper into what is meant by “Open.” Possibilities are about what might and might not come to pass. If God is all-knowing, then it must also be the fact that God knows all of the future. Open Theists agree that God is all-knowing and that God knows all of the future, and like others, they think that some of that future is possibilities, but what sets Open Theism apart is the belief that God knows possibilities as possibilities. So, Open Theism then denies that God faces a future of only settled facts about what will or will not be, and insists that God knows the future as partly settled (or ‘closed’) and partly unsettled (or ‘open’). Only God knows all that is ‘closed’ or ‘open’ about the future. Ok, let’s stop right there and break this down a little bit… Why would Open Theists think that God knows the future as partly composed of possibilities, and not only a future of settled facts in the mind of God? What does this have to do with possibilities? Well, Open Theists believe that if there is this kind of a free-will, then this is a big part of what makes for a future with possibilities. The fact that we might do *this* but we might do *that* means that the future is neither definitely *this* nor *that* and if the future is neither, definitely *this* nor definitely *that* then this is the kind of future that God knows. God knows a future that is full of *this* or *that* coming to pass, depending on what free-will beings do… a future comprised of possibilities dependent on the actions of free-will beings. Christian Open Theists also make an appeal to scripture passages that seem to describe God as facing a future of possibilities. See some of those scriptures here and some responses to some of the most common objections. That’s the basics of Open Theism, as I understand it. Some may object to Open Theism on the grounds that, “I think that humans can have free-will and that God knows everything we will or will not do.” Open Theists contend that, if free-will is the kind of free-will being described here, God knowing precisely what we will do, and our being able to do otherwise is a contradiction. Not a paradox but a contradiction. Now to be clear, Open Theists do not believe that God knowing what we will do, keeps us from acting freely. That can’t be emphasized enough. What Open Theists contend is, if the truth about how we will act, comes prior to the act (<- and this is the truth that God knows), this shows us it cannot be true that we are the ones who make that truth. We can’t rewrite that truth that God knew prior as, what will be.